The morning train to Hungary took a little over three hours (a little confusing as it was listed as going to Belgrade) and I arrived at Flow Hostel just after lunch. This hippy-style 3rd floor apartment hostel consists of 2 rooms with bunks that look like they’ve been carved out of tree-trunks, brightly coloured walls and quirky decorations like the cheese-grater light covers. It was a lovely change from some of the massive hostels that I’ve been in lately, which come across as somewhat soulless and more like cheap hotels than hostels. I had a coffee with the hostess on the balcony overlooking the city in the warm sun before changing into cooler clothes to hit the sweltering heat of the city below. 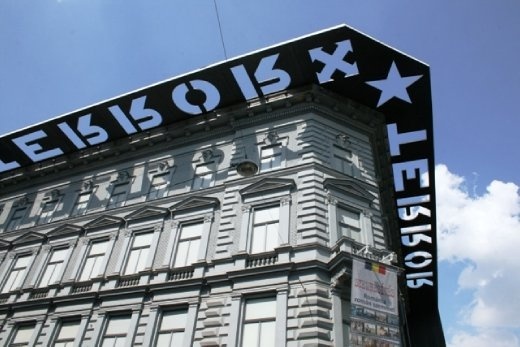 I started my tour at the “Terror House” on Andrassy Ave, made infamous as the headquarters by both the Nazi Arrow Cross and later the Communist Secret Police. It was a very sobering visit, from the tank that crouched toadlike at the foot of the light well surrounded by a four-storey wall decorated by the faces of “victims” to the videos of Nazis and concentration camps, to the harrowing accounts of the communist “horror 50s” and those who were arrested and sent to gulags, and finally ending with the reconstruction of the prison and torture cells. I finally emerged into the blinding sun and managed to purge my soul with a walk past parliament and across the chain bridge, then down to the green bridge and back via Vaci utca and the supermarket. Whew! I started the day with another free walking tour, which was a great 2.5hours filled with interesting facts and anecdotes about Budapest from a local guide. It was also where I randomly ran into an Argentinean guy from the walking tour in Bratislava – it really is a small world! We started off in Vorosmarty Square and passed the chainlock tree on the way to Elizabeth Square and St Stephen’s Basilica, where the “Szent Jobb” mummified hand is preserved hanging from the rafters of the church. It is said to have come from a man who tried to steal something from a Madonna Statue, whcih then grabbed his hand, and the only way he could be released was to have it chopped off. We then passed Parliament and crossed the Chain Bridge before climbing up Castle Hill to, ironically, not a castle but a Palace, where a policeman’s band was playing. We saw a section of wall with bullet holes remaining from the war, and an old Soviet-era car that people would wait 15-20 years to own. We were also shown the correct way of scaling the horse statue of Andra’s Hadik in order to touch the horse’s testicles for luck. I have to deal with enough testicles in my line of work so decided not to do the climb. We stopped at Matthias Church with its ornate roof, painted inner walls and the Virgin Mary that remained undamaged even through the invasion by the Turks. We finished our tour at the “Fisherman’s Bastion”, a Disneyesque edifice on the eastern edge of Castle Hill. After the tour I wandered into the “Fois Gras” Festival and stopped for a beer in the sun, choosing not to indulge in goose liver pate made by forcefeeding geese enough grain to cause their livers to explode with fat. I prefer to treat liver disease rather than support causing it. Feeling refreshed, I checked out the Matthias Wall, a massive hunting-scene fountain which was pretty impressive. I finally made my way out of the palace, passing the “zero statue” from which all distances are measured, and hiked up and over Gellert Hill, named after the bishop who was nailed into a barrel and thrown off the Elizabeth Bridge into the Danube by the pagans. I trekked up to the Szabadsag szobor, a communist-era statue of a woman that is now a “lady of liberty” after the accompanying soldier was removed. I was a bit surprised by the hundreds of people at the top of the hill as I’d walked up quite a deserted path, and then saw the buses picking their way up the road on the other side of the hill. After a much-needed ice-block I walked back down and crossed the Green Bridge. Unfortunately the Market Hall was shut so instead I walked through the pedestrian street of Vaci utca to refill my bottle at the Vorosmarty fountain. I was glad I’d packed my umbrella as the ominous thunder that had been rumbling all afternoon finally broke into a downpour , sending people scuttling for shops and awning covers. The hostel is so chilled out and peaceful it’s difficult to leave for the day! The owner has been making me coffee every morning and we chill out on the beanbags having a lazy start while the city below wake up. As I was woken by the church bells ringing I decided to walk down to St Stephen’s Basilica, not to gawp at St Stephen’s mummified hand, but to join the locals for a 10am mass and listen to the 600 pipe organ and choir give an amazing performance. After mass I walked around the Synagogue and then up to the City Park where I checked out the “Hourglass” statue (random hourglass in a wheel) before heading over to the Szechenyi Thermal Baths. These are the biggest thermal baths in the city and are pretty impressive, but it was too hot to spend much time inside, so instead I spent a couple of hours lying in the sun by the outdoor pool (which was packed). I decided to pack up when the thunder started up again, and managed to make it home before the evening rainstorm.